It's been a busy week so far and I've still a lot to pack into the rest of the week! Isabelle's been off school sick the last couple of days, just a cold with a nasty old cough. Here's hoping she'll be feeling better soon, I hate seeing her under the weather. 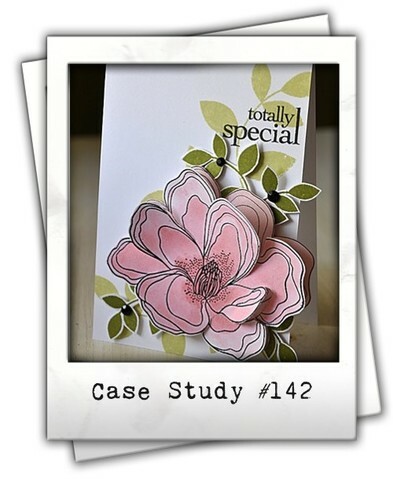 Anyway, on to the card, it's week four already at CASE Study with Maile Belles as our muse. Check out her beautiful card this week. I went slightly less (ok a lot less) CAS this week. I CASEd the floral focus and general layout of Maile's card. The sticker sentiment is from Sticker Sentiments - Wishing You Well from SRM Stickers and the Flax Twine is also from SRM Stickers. The flowers are from Tilda. The pink dotty cardstock is from Spotted Tillie Dot by Core'dinations, it's actually a pre-embossed cardstock that comes in a range of colors. I partially sanded it using the Sand-It Gadget. 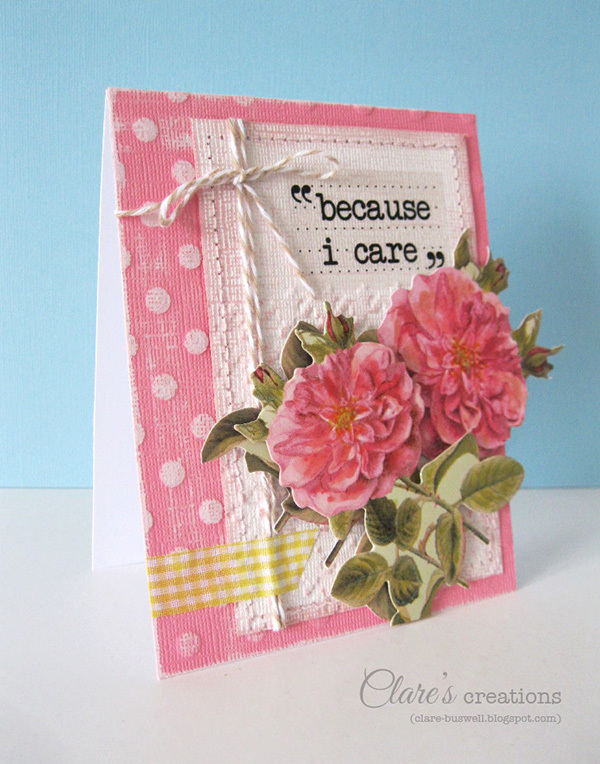 The light pink cardstock is from The Whitewash Collection by Core'dinations and I embossed a section of it using the Houndstooth embossing folder to add some texture. Don't forget to visit the CASE Study blog to have a look at what the rest of the team created. Thanks for dropping by! I'll be back on Sunday with some previews for the Waltzingmouse Stamps May release!! 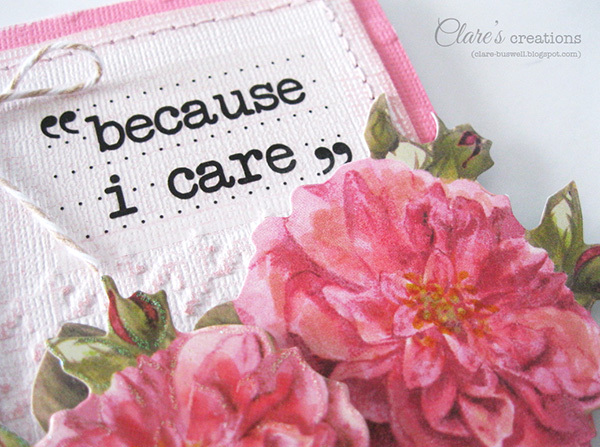 What a beauty, Clare, with so much lovely detail!! 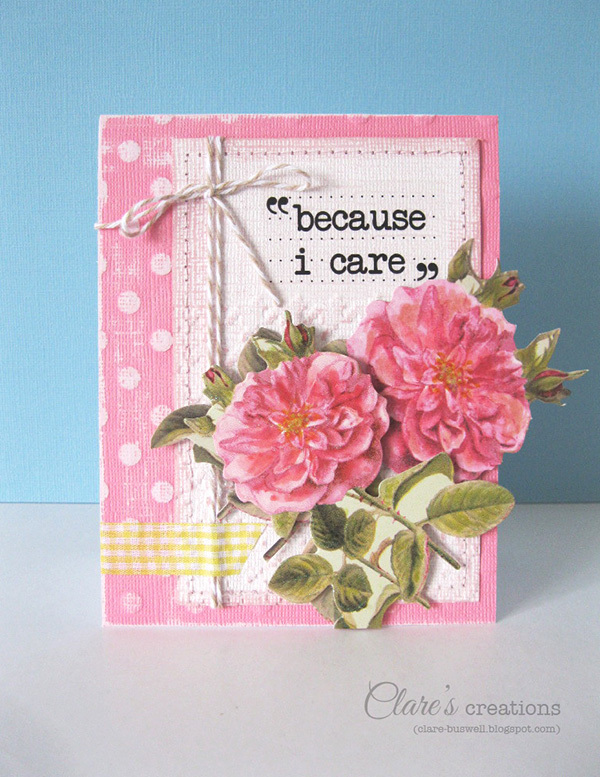 this is very beautiful card! Love this card. The height of the popped up flowers and leaves is very cool! I am inspired! Very pretty . TFS . I really appreciate your comments, thanks! A card for fun on Friday!